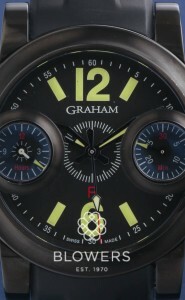 Founded in 1695 by George Graham in Fleet Street, London, Graham watches boast technical expertise and playful aesthetics. Manufactured in La Chaux-de-Fonds, the watchmaking capital of Switzerland, Graham movements are engineered to the highest standards. Popular collections include the aviation-inspired Chronofighter, the motor racing-inspired Silverstone, and the Geo.Graham range which explores the connection between science and art. Known as the father of chronograph, George Graham was responsible for innovations including the dead beat cylinder escapement and the mercury pendulum. 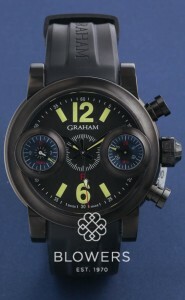 Browse Blowers’ current stock of unused and used pre-owned Graham watches below. Looking for a specific model? Get in touch and we will endeavour to source it for you.